Of Wiarton, peacefully at Gateway Haven, Wiarton, on Wednesday, August 14, 2013. Bernice Marie Bartley (nee James) at the age of 88 years. Loving wife of Mel. Cherished mother of Dennis Hunt (Barbara), of Oakville, and Mary (Rod Saunders), of Walter's Falls; and step-mother of Pat Wardrop, of Nanaimo BC, Connie (Tom Finlay), of Havelock, Bill Bartley (Barb), of Wiarton, Murray Bartley (Joan), of Durham, Steve Bartley (Karen), of Calgary, and Donna (Roger Hepburn), of Wiarton. Loving grandmother of Shirria, Rick, Belinda and Michael Hunt, Steven Gilmore, and Ian Britton; and great-grandmother of Emily, and Brittany. Sadly missed by her sisters-in-law Valarie James and Olive James; and many nieces and nephews. Predeceased by her parents Christopher and Mary; husband Edward Hunt; daughter Betty; sister Irene (John Anderson) and brothers Ross (Edna), Stanley (Hazel), Grenville (Rennie), Bob (Florence), Marshall, Ken (Fran), Warren, Clinton, and Arnold (Beth). Bernice worked at the TB hospital in Gravenhurst; during WWII, at the age of 16, was an overhead crane operator; later finishing her working career as an RPN. Family invite you to gather with them for a time of visitation at the Thomas C. Whitcroft Peninsula Chapel, 272 Berford St., Wiarton (519) 534-5341 on Friday, August 16, 2013 from 7-9 PM. 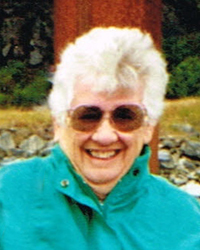 A funeral service to celebrate Bernice's life will be conducted from St. Margaret's Church (Anglican), Rutherglen, on Monday August 19 at 2 o'clock, with visiting two hours prior. Cremation to follow with interment in Mt. Pleasant Cemetery at a later date. Donations to St. Margaret's Church, or the RCL Branch 586 Hepworth would be appreciated.